Unused-Used: Fabcar Case Packer Model C212KVB3 . 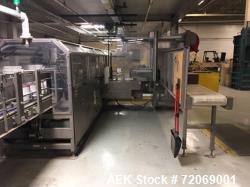 Unused-Used: Fabcar Case Packer Model C212KVB3 . Carton Blank is vacuum picked from magazine and formed through a 3 sided mandrel which forms and glues rear major flap and leading and trailing minor flaps. Product travels into right angle indexer from a 12' long side belt driven conveyor. 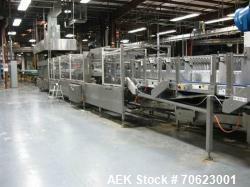 Product is collated into multiple rows, then inserted into open end of tray by pusher plate. Tray is then advanced through guides which forms and glues front major flap. Completely formed tray is then advanced to final pusher plate assembly transferring the tray to outfeed spot. Tray size range: length 2" - 12" x height 1" - 6" x width 2" - 12". Currently set to 10 3/4" x 7 3/8" mandrel. 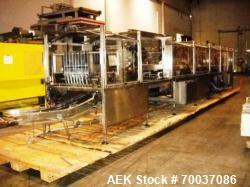 Infeed conveyor adjustable to 1 1/4" minimum width x 7 1/4". Conveyor height is 34". Lugged infeed with lug plates on 13" centers. Good working condition quote is set to one size subject to receipt of samples. 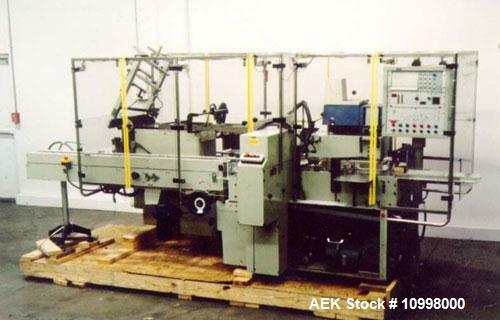 Last used in pharmaceutical operation collating cartons into trays at speeds over 200 cpm.